Please see interaction Page for my replies/views to your comments on the GW article. The UAC which was over S.E. Uttar Pradesh, is now located over M.P. and has descended to sea level as a low pressure area at 994 mb. 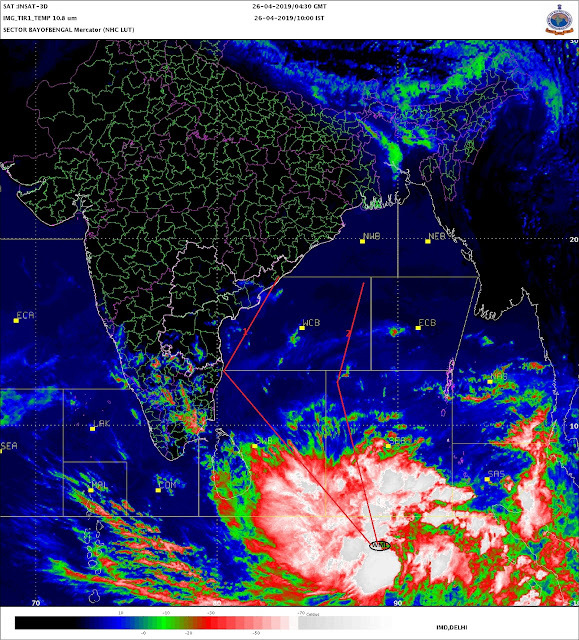 Expected to move West/NW and slide into S.Rajasthan. Result will be heavy rainfall west M.P.and Northern Gujarat next 2 days Tuesday and Wednesday. Rainfall up to 100 mms expected in these regions. Moderate rains over Saurashtra for Tuesday and Wednesday, with 2 days rain accumulation up to 40-50 mms. South Gujarat, including Bharuch, will get some showers on Tuesday, with about 20 mms of rain. Lesser rains on Wednesday. Precipitation can track into lower Sindh by Wednesday/Thursday. Karachi can expect moderate rains on Thursday/Friday. Rains amounts around 10-15 mms. Tuesday: Cloudy, with a few showers and bright intervals in between. Again, a heavy shower possible in the evening. rain amount 12-15 mms. average. Some of the extreme rains occured in history - most recent being Mumbai July 26 2006!!!! Imagine Gujrat,Lakshadweep being one of them? Wikipedia articles on Global Warming are biased. There are some editors who have done mass editing of GW articles. Google it and you will understand what I am talking of.